Candy Nakamarra was born in 1964 in Papunya. She learned painting from her father Johnny Warangkula Tjupurrula. He was one of the most important painters of the early days of Aboriginal Art under Geoffrey Bardon and also one of the founders of the Papunya Tula Artists collective. In her rhythmic work, often carried out in two colors, Candy depicts the feminine stories of the mythical Tingari Cycle, with fine lines and repetitive patterns. The Tingari Cycle is a collection of religious stories, ceremonies and laws that were transmitted to the inhabitants of the Western Desert by the Tingari. This was a group of mythical, spiritual beings that according to legend travelled a huge area of the Western Desert while teaching law and performing rituals and thereby shaping the landscape and various holy places. Candy’s style is reminiscent of the optical line work painted by artists like George Tjungurrayi, but is more angular and repetitive. Yet her work often has a similar illusionary effect. 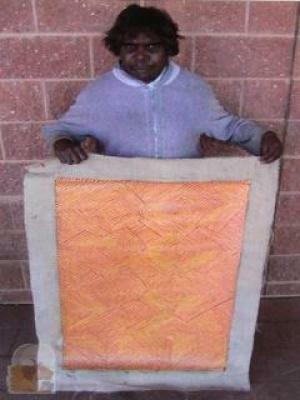 Besides his daughter Candy, Johnny Warangkula also taught his son Mike Nakamarra how to paint. Both are currently regarded as promising artists.